So far, we have highlighted Drizzle (a beautiful green-blue color that will have you dreaming of the ocean in no time), Keystone Gray (a medium toned warm neutral “greige”), Urbane Bronze (a darker gray with a slight bronze undertone), Greek Villa (a subtle creamy off-white) and Amazing Gray (a go-to light gray). This week, I wanted to focus on the color Alabaster SW 7008. I decided to feature Alabaster this week for several reasons. For one, I just plain love this color. Second, I specify this color SO often that I wanted to highlight the benefits and reasons that make it one of my top go-to off-whites. There is a reason that Sherwin-Williams named this color the Color of the Year for 2016. Even though that was 2 years ago, this color is still going strong! 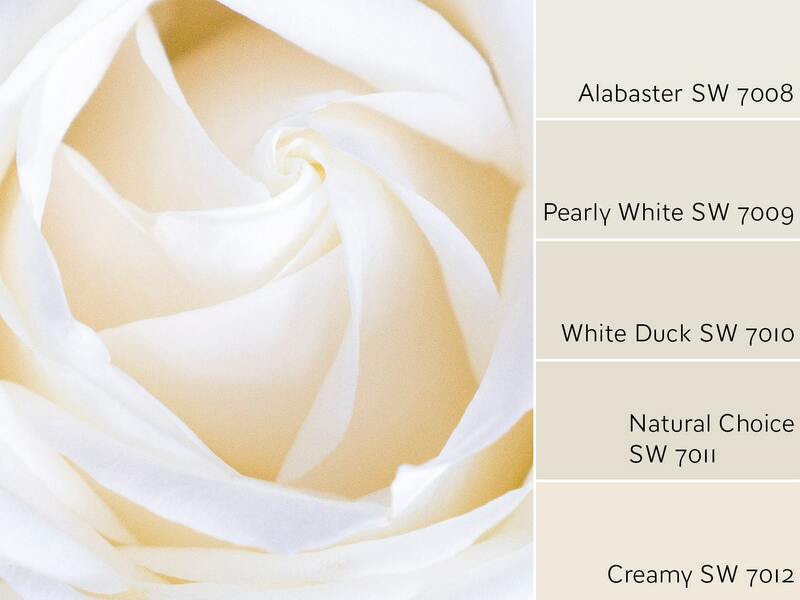 If Alabaster sounds intriguing and you want see what other colors and schemes could coordinate with it then check out the color schemes I believe will coordinate nicely with it. I scoured the net and put together a Pinterest gallery of Alabaster. See it below and let me know which you like the most. If you have your own pictures send them to me and I will post them! Alabaster is categorized as an off-white with subtle undertones of greige/beige, which honestly reads more like a creamy and crisp warm white in both interior and exterior lighting. It is just “off-white enough” to not be super bright white and is ideal for a softer white look. I believe that is what makes Alabaster so popular, mostly for those that wish to have a white that will still pop against their wall color, without being too glaringly white. Alabaster can definitely work as an overall main wall color. Especially if you are going for a more clean and modern feel in your home. This creates a crisp backdrop for color in furniture, drapery and other accents in the home. 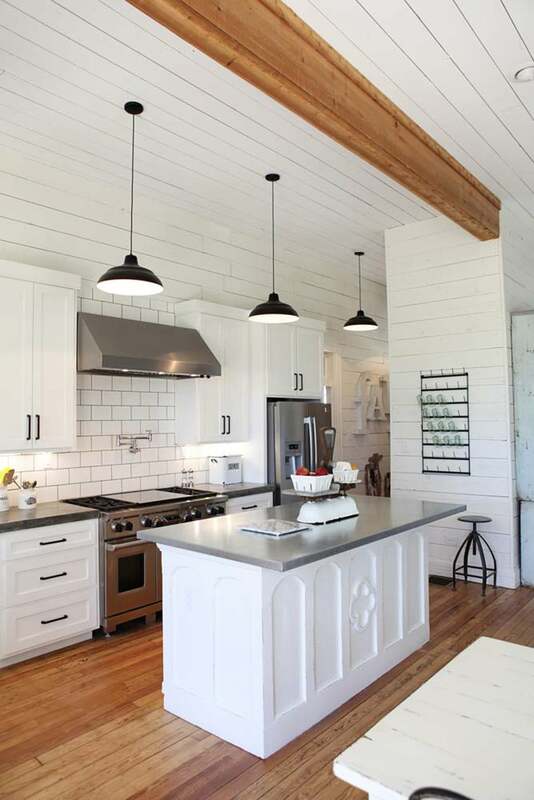 I love it on shiplap walls if you are leaning towards the farmhouse style. I mean, it’s in Jo’s kitchen, so it’s gotta be good, right? Another area (besides the kitchen) that can benefit from Alabaster, is the bedroom. I love the idea of using Alabaster as a wall, trim and ceiling color as the foundation for a little girl’s room! Then, you can go to town on brighter colors and accents. 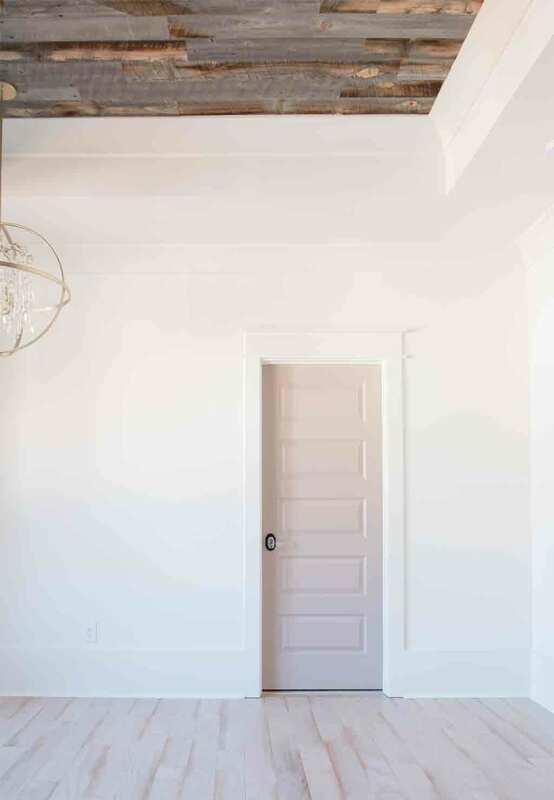 In the inspiration picture below, they painted the doors a soft pink, which I totally dig. Alabaster is optimal to contrast against textures like rustic wood, as shown in the ceiling detail or for a hand-scraped wood floor. 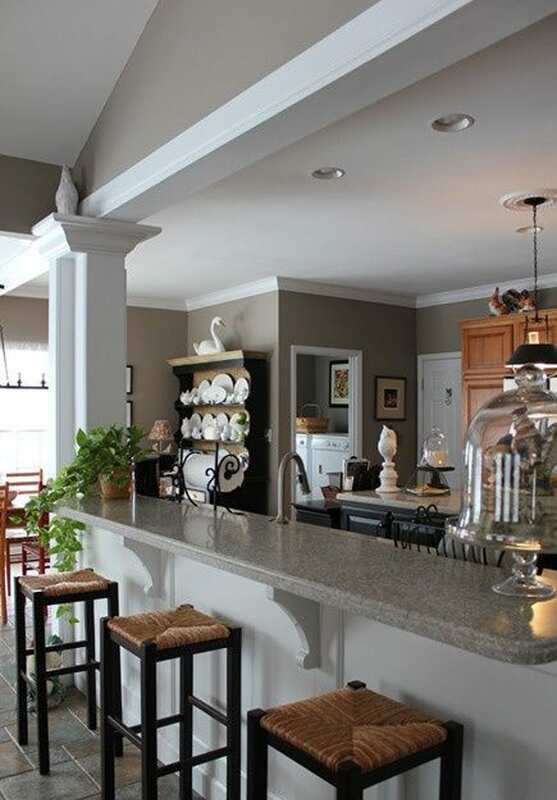 Even if you don’t end up painting your walls in Alabaster, it is gorgeous as a trim and cabinet color. It really is one of my top specified off-white color for this very purpose. I typically spec this color if the client doesn’t want to go bright, bright white and maybe has some selections that are a bit on the warmer side. Remember that Alabaster is creamier than a super white color, which makes it ideal! I love that it allows the wall color to contrast against the trim, while still keeping the look soft and subtle. Alabaster not only shines for interiors, but it is lovely for exteriors as well. I have specified this color a ton for my Exterior Color Consultation clients lately. I had a client who wanted to paint her brick and I chose, you guessed it, Alabaster! Like I have mentioned in other posts, Alabaster comes out looking brighter on exteriors, so if you are really looking for a more creamy color for your exterior, look for a darker color that has more of a beige undertone. If you do, however, want a brighter white exterior, then Alabaster is perfection! You can see for yourself in this inspiration picture with gray shutters and an aqua blue door how spectacular it looks. If you are considering Alabaster, the best way to find out if it is right for your space, is to grab a sample and test it out. If you are still having trouble deciding, contact me for a Color Consult to nail down the best color for your interior or exterior. I have a passion for color and love being able to help clients find the right color to make their home beautiful! Alabaster had the spotlight, but I also wanted to highlight a color from the Color Wheel update, Sticks & Stones SW 7503. I actually researched this color recently as I was considering it for an interior overall wall color. This client wanted a warmer, more saturated color. Sticks & Stones has a taupe undertone and is definitely a warmer neutral. If you like Balanced Beige, but want a darker color with a bit more brown to it, then consider Sticks & Stones! I also like the thought of using it for a trim color with off-white walls. I love Alabaster too! The graphics you used to illustrate the color inspire me (almost) to change my walls! Thanks, Betty! You are sweet to comment. 🙂 Alabaster is a great option for a wall color if you are up for a change. I just finished painting our family room/kitchen area Balanced Beige with Alabaster trim after reading your Color Wheel blogs. I would look for a wood floor that has the same cherry undertone, but one that is a slightly lighter or darker. Mainly, keep the undertone the same, but try to add some slight contrast so that it doesn’t look too matchy-matchy. An example is going with a medium brown wood floor that does have some warmer red tones to it (similar to the cherry cabs and crown). I hope that helps you narrow down some choices! Thank you Laura – I didn’t think this would be so difficult! I’m so happy I recently ran across your blogs as we are getting ready to have our kitchen cabinets painted. Especially happy to read your take on Alabaster for cabinets as it’s one of my top picks. Have you ever seen/ used Aesthetic White on walls with Alabaster cabinets? Wanting to keep walls in kitchen and adjoining rooms a lighter color but still looking for contrast to cabinets. Thank you! I do love Alabaster for cabinets. 🙂 Aesthetic White on the walls won’t have that much contrast against the Alabaster cabinets. Try one shade up from Aesthetic White, Accessible Beige, for a bit more contrast. Keep me posted on how it turns out! Vicki – would you be able to share any photos? I have alabaster cabinets, and really love agreeable gray but trying not to pull out any yellows in the cabinets. Laura would like your take also!!! Tonya, I don’t think I can. I can’t copy and paste a picture in this section, if there’s another way I’d be glad to do that. We are building and I need to choose an off white trim color for the exterior to go with my Triangle Brick Oyster Bay color with white mortar and grout. (it’s an off-white brick with blue/grays in it) The gutters and spouts are brown. The windows and garages are also brown (similar to Chateau Brown from SW). The roof is a gray/brown (Tamko Aged Wood) I’m having the hardest time finding a white for the exterior trim!!! Most are glaringly white. Our last house had Shoji White but I think that’s a bit too gray for the look I’m going for this time, mixing warm (brown) and cool (gray) neutrals. I’m leaning toward Alabaster but my husband thinks it’s too white. I do NOT want yellow tones. Your posts have been most helpful…. but I’m still unsure. haha. But what I would LOVE to know is, what color paint is on the shutters of the all white house in Texas you posted on this blog post? That gray is perfect for my house’s shutters, I think? Do you remember the color? THANK YOU! Thanks so much for reaching out! Alabaster does get pretty white on exteriors. The best way to find out is to test a sample to see how it looks. You could even try Shoji White too. You may be surprised at how white it gets and could be the right choice! Keep me posted and let me know if you would like to sign up for an Exterior Color Consultation. I’m not sure what color the shutters are on the Texas house, but if you click on the link, you may be able to find out. Thanks again for reaching out and have a great weekend! Hi, Laura! How do you think Alabaster would work on ceilings with SW Extra White crown moulding? Would it allow the moulding to shine, or would it clash? Walls are Agreeable Gray in one room and Wool Skein in the other. I’d love to hear what you think! Love reading your blog- thank you!! Thank you so much! I do think Alabaster can work on ceilings with Extra White crown molding. Keep me posted on your project and thanks again for reaching out! Do you know the light pink color that was used on the little girls bedroom door? I’m sorry, I don’t, but you can click on the link below the picture and view the original blog to see if it’s there! Thanks so much for reaching out! I’m trying to choose an exterior off white color for my home. 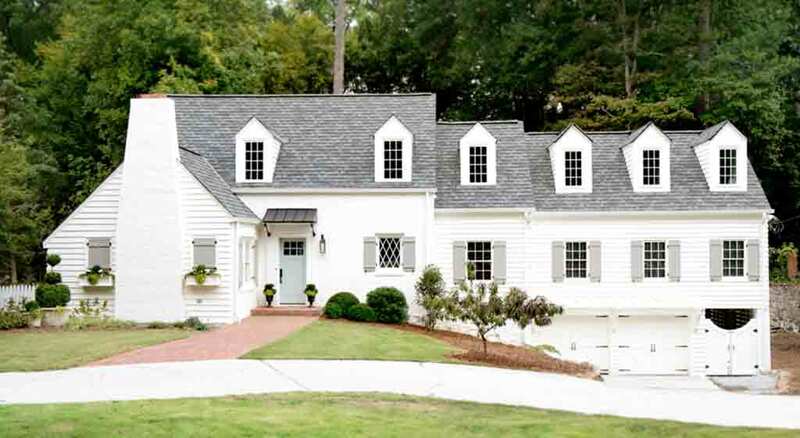 It is in the country and resembles a farm house. I was thinking of Alabaster but I don’t want bright white. This color does appear warm and softer in some lights. I don’t have much time so I’m feeling stressed. Thank you so much!! Alabaster can get pretty bright on exteriors, but the best way to find out is by testing it out. Let me know if I can help with a quick turnaround for your exterior trim color. I would love to help! So glad I found this! I am having my living and dining room walls painted using Alabaster, I am now trying to find a brighter white to go on the trim, any suggestions? We really like the look of black and white interior with some brown wood accents. Can you do alabaster with tricorn black? We were thinking Walls, trim, cabinets all in alabaster and the doors in tricorn? Our Build only uses SW. Thanks, Ben! I hope to hear from you soon! This was so helpful!! We are painting our nursery Alabaster white. What color do you recommend for trim, doors (room & closet), and ceiling? I have read to use SW Extra White. I am so glad you found this post helpful! For help picking the right color for your trim and doors please check out my Interior Color Consultation packages in my shop and select Trim/Cab as your package. I loved the picture of the home with the alabaster exterior. You mentioned that the home had gray shutters and an aqua door. Love it! Do you know the name of those colors as pictured? Thanks so much! !